For nearly two decades, deploying Data Loss Prevention (DLP) has been a staple for enterprises seeking to secure their data assets. "the UEBA market is quickly disappearing as UEBA becomes a feature of many other security domain solutions"
The most common criticisms boil down to the claim that DLP as an approach is obsolete, and the approach to protecting company data needs to be more “specified”, honing in on dangers like the insider threat. Other elements of DLP, such as sensitive data detection and classification, as well as endpoint monitoring, are unnecessary and more importantly don’t demonstrate a quantifiable return on investment. This is not the first time we’ve heard declarations of DLP’s demise. Scares like this have popped up several times in past years, only to dissipate shortly after. 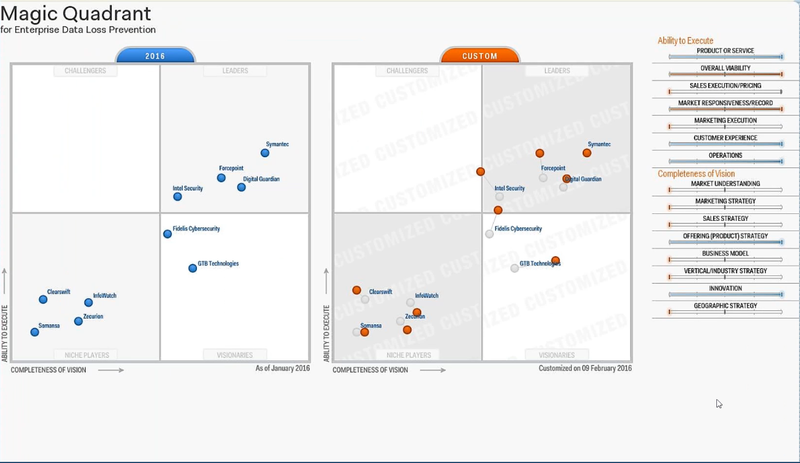 Indeed DLP is still one of the fastest growing fields in the IT security industry. The escalating demand for these programs has driven forecasts that show the DLP market continuing its annual double-digit percentage growth for the coming years. As companies face ever expanding challenges in securing their data, from regulation compliance to diversified tactics by cyber criminals, the need for effective Data Loss Prevention is only increasing. This is not to suggest that conventional DLP solutions are without their drawbacks. The weaknesses in common DLP programs lie in the way their operational models, using pre-set algorithms and regular expression patterns to determine what “sensitive data” is. This leads to serious issues in identification accuracy, the key to effective DLP coverage. Analysts from The 451 Group have written "DLP has suffered from two primary shortcomings: it's generally a challenge to implement, and it does next to nothing to help protect data from outsiders” hence these DLP solutions need to add additional inaccurate solutions such as UEBA and user analytics. In fact, a Gartner "leader" of the now defunct Magic quadrant report recently posted on their corporate Facebook page: "Antiquated DLP solutions provide little value.... That’s why we’ve incorporated both UEBA and EDR capabilities into our platform." *, a basic admission that their DLP system has failed. It is these weaknesses in traditional models (including many Gartner "Market Leaders") more than anything else that deter companies from investing in complex, intrusive DLP systems, that are also not able to produce efficient results. Today’s critics of traditional DLP, declaring it an outmoded method, were on to something when they pointed to accuracy as the central challenge to implementing an effective solution. Lack of accuracy means systems are often fumbling in the dark to locate and identify sensitive data, while at the same time producing mounds of false positives that soak up man-hours and company resources. The DLP solutions of GTB give organizations the assurance of effective DLP without impeding operations or monopolizing resources. GTB’s smart programs, powered by intelligent mathematics, accurately identify compromising data throughout the entire system. This includes information both on the network and off, including cloud applications and the endpoint including protection against malicious insider or malware-based data exfiltration. 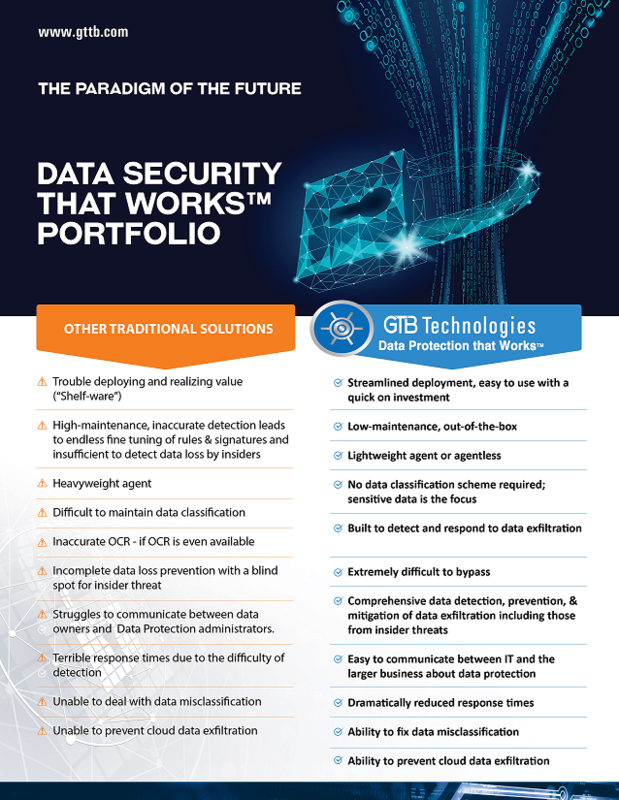 Far from being a relic of the past, as are other DLP and Insider Threat solutions; GTB’s cutting edge technology gives organizations measurable protection of their intellectual property and total control over their data assets. GTB's data protection that works platform is the market leader ... all without paying analyst's or agreeing to their misguided opinions in hopes of a 'referral'.